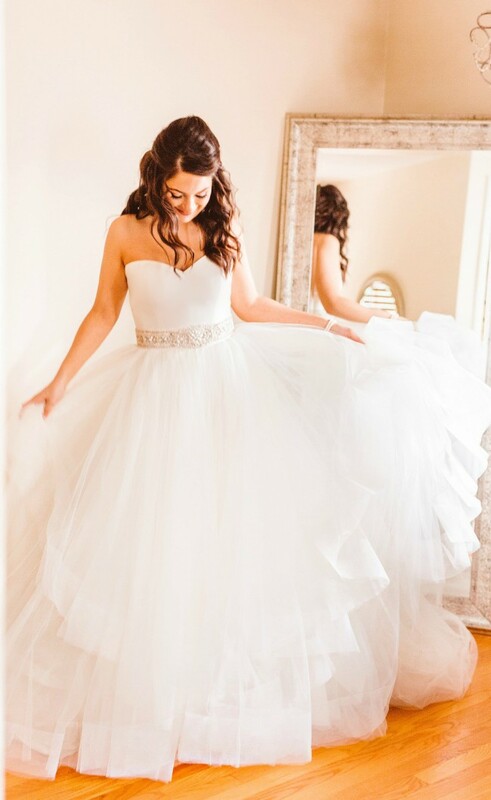 This dress is stunning! It has been freshly drycleaned and is presented in a beautiful clean carrying box. The dress retailed at $1,400 including the belt, which has been detailed to ensure no missing beads. I also added on the Justin Alexander jacket ($220), which is made to perfectly match the dress. I chose to wear the jacket for the ceremony and take it off for the reception (2 dresses!). The jacket has pearl and lace detail and has been altered to hook into the dress securely under the belt. Finally, I have included the cathedral veil ($600) which has been detailed to ensure all beads are intact. This dress has been taken in at the top to fit a size 6 top, with no cups put in (I didn't need any as a 34C but you could certainly add them). The dress has also had a beautiful bustle put in. The jacket has also been altered to fit a size 6. Finally, I am 5'5" and my heels were 3" so the dress drops to the floor at about 5'8". Once you send a message, Angie can invite you to purchase the dress.